To simplify saying "Serial networking for the Animatronic Avian project", I've decided to instead just name the software/firmware of the project after the desktop software I've started to make to control it all; "Elias". I've started to build up what I plan on using for the interface boards for the project. I start with the exposed DB-15 connector, and wire it up directly to a piece of strip board to hook it in on the FTDI serial network wiring. I'm building them such that I can plug a bunch of these in directly into each other for debugging, or space them out with long cables between them for long distance testing. I can also integrate these right into the final devices when that happens. The prototype I made first is seen in the above image. 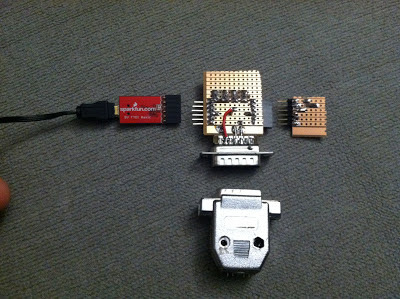 The FTDI USB-Serial adapter is on the left. That is plugged into a 6 pin header on the left side of the middle board. 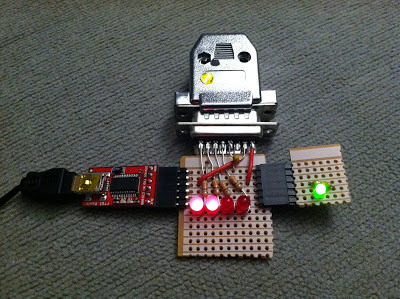 This hooks up power and serial to the DB-15 widget (Arduino), with a breakout for the four data lines on the connector (D10-D13) to LEDs. The serial out from the widget goes to the 6 pin header socket on the right. The board with the green LED on it is the serial terminator. It simply connects the RX to the TX so that serial data gets sent back through the return. The LED is just hooked up to power through a resistor, and acts just as a power/connection indicator. For completeness, here's the backside of water. The above works well as a simple test rig for now. Now that I've made this one, I have ideas on how to make the next one better. Namely, a way to better lay out the data lines to a breakout area. I will be using a pair of these to hook up to my power box, to be used as a proof-of-concept for the protocol and syncing software. I also plan on experimenting with using the 5 pin output for the stepper motor, to drive more outputs. Even if I get that working, I will still use two of these to drive the 8 inputs on the switch box, just because I can. Now that I made this one, along with preparing the DB-15 plugs, and making the terminator, all of which took about an hour, I should be able to make the next few of them much quicker.